Welcome to Mentor for Bank Exams. IBPS SO (Marketing - Officer) Exam 2017 is going to be conducted, we hope you all have been preparing well for this exam. 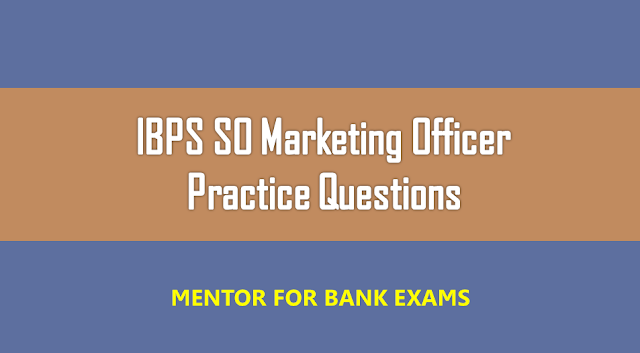 To brush up your preparation at this stage, here are some most important questions from previous papers for IBPS SO (Marketing Officer) exam. All the best!!! 5. Which of the following statements about choosing a name for a new soft drink is UNTRUE? 7. _______ shows how consistent customers are in buying your brand, how long they have been buying and how long they may buy? 8. _____ of ad means how frequently you should expose your target group to your message. 10. What approach should a brand manager adopt to know the status of a brand in terms of consumer perceptions? 11. ______ is getting into different versions of the same market?